What makes Instant Pots so great? It’s the fact that a single compact device can handle multiple tasks from pressure cooking and slow cooking to steaming and even making yogurt. That’s the same idea behind the Oster Dura Ceramic Air Fryer, which just so happens to be our favorite air fryer on the market. 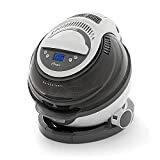 It has a nice large 3-liter capacity and a special tilted design that allows it to air-fry more evenly than comparable fryers, but it also has a bunch of other cooking modes like grilling, roasting, and sautéing. It’s a single device that can take the place of several of your old kitchen gadgets, and we couldn’t recommend it any more strongly.